This article is based on a presentation given by Michael Doane, CadmiumCD Marketing Manager, and Rachel Vrankin, CadmiumCD Brand Manager, at CadCon 2017. Illustrations by Terrel Sleeter. I hear it all the time. “How do I effectively market my events?” This is one of the greatest challenges meeting planners face. They want to improve app adoption, engage attendees with content and on social media, and increase visibility for their sponsors and exhibitors. This is a great definition, but it’s a bit too technical for me. What I like to say instead is that marketing is everything you do. Event marketing is still everything you do, but it’s a little different. Events are a representation of everything you stand for in a very condensed period of time. Your event is the highest ideal of your organization’s brand. It brings together the culture of your organization and membership, the content your audience cares about, and connections between like-minded individuals. This is why event marketing requires a HOLISTIC approach. We as meeting planners know that the smallest details matter. This means that everything must come together in perfect unison. Event marketing is also more challenging because you’re trying to reach various stakeholders with your messaging. Marketing to members and attendees is very different than marketing to your staff and volunteers. 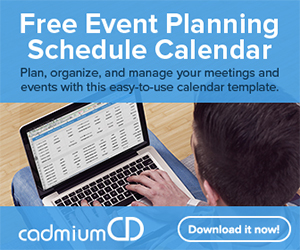 *Download CadmiumCD’s Event Marketing Worksheets to follow along and build your own event marketing success plan. Let’s go over each stakeholder group and examples of activities (aka calls to action) you may be marketing to each. What is the best way to reach stakeholders? Hint: It’s NOT putting logos all over everything. There’s a common misconception that if you put your brand all over everything, your message will come across. This is simply not the case. Michelle Wyatt, CadmiumCD co-founder and CEO, reminds her sales and marketing teams that it takes 7-10 touchpoints over at least 3 different channels to drive action. Another Hint: It IS reaching people on multiple platforms with the same messaging over a sustained period of time. Ensuring that your stakeholders have a clear indication of what you’re trying to help them achieve, and that you reach them with this message multiple times on multiple channels, is the best way to get your message across. More on this below, in the section titled “7 Steps to Event Marketing Magic.” First, let’s briefly explore examples of channels available to most planners. Having a consistent message across all these channels is essential for event marketing magic. Now that we’ve established what marketing is, how event marketing differs, various stakeholders at events, and how to reach those stakeholders effectively, let’s walk through the process of creating a comprehensive event marketing plan. Step one is to create a goal. Without a goal in mind, you won’t know how to measure success. For our sake, we’re going to use “Increase App Adoption” as an example. Since we’re trying to increase app adoption as an example, I’m going to list out all the available channels I have to market my event app. These channels are going to include digital and analog channels I have access to before, during, and after the event. Email – I can send reminders to download the app. Social Media – I can Tweet about the app with my event hashtag. Digital Ads – I can include ads on my event website to remind attendees to download the app. Video – I can create a custom video that explains why attendees should use the app. Digital Signage – I can include QR codes that can be used with the app or social media walls that create FOMO. Onsite Support – I can have my app company provide support to remind people to use the app and help them if they are having trouble. Gamification – I can create a scavenger hunt with the app, again incentivizing people to download and use the app. Print Ads – I can include information about the app in my show daily. Speaker Announcements – I can have speakers remind attendees to use the note-taking and audience response features in the app. Surveys – I can use in-app surveys to increase engagement after the event. Evaluations – I can allow attendees to gain CE credits through the app and evaluate sessions and speakers. For our sake, I’m going to say I have an eventScribe Website. I can use that website to promote the eventScribe App. I also have an attendee list, so I can easily put together an email campaign using CadmiumCD’s event management software. I’ve also contracted digital signage from an AV company, so I’m going to leverage those to engage attendees with the app. To accomplish the above, I realize that I need QR codes for my digital signage, an email template and copy to use to ask attendees to download the app, and ads for my website. I can use In-House Designers to create these assets. I can hire a Marketing Agency. Or I can use my Tech Vendor Templates, if available. Luckily, I’m working with CadmiumCD, so I have access to basic design services and templates. They can help me create ads to promote the app on my event website, they have email templates with pre-written copy to send out to attendees, and I can create QR codes with the Conference Harvester software system, which can be displayed on digital signage that I rented from GES On Services. Once we have all the assets in place, the next step is to get everything out into the world in a strategic way. We want to be able to track all deliverables and who is responsible for them. Google Spreadsheets – My go-to to create spreadsheets for free project management. Great for lightweight projects, but not ideal for managing big campaigns that revolve around something like an annual meeting. Multi-Channel Event Marketing Worksheets – This will help me plan and work out some of the finer details of the increase app adoption campaign. Includes a channels check-list, campaign planning worksheet, and stakeholder marketing worksheet. 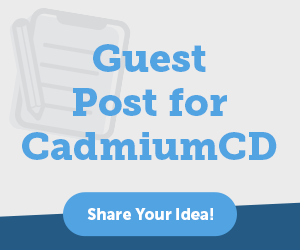 myCadmium Boomerangs – Free with any CadmiumCD project. Allows me to make requests to CadmiumCD project managers or manage tasks assigned to my own staff. Once we launch our app adoption campaign, we’ll want to periodically check to see how it’s performing. This step is tied directly to the goals we set in step one. Who is engaging with emails? – Since we’re using CadmiumCD, we can send emails via the communication tool, then pull stats like clickthrough rate and views to see if attendees are opening the emails and clicking the download link. Pull App Stats – This is very easy with eventScribe Boost. I can view app stats like number of users, which devices they’re on, and presentation downloads all from eventScribe. I can also pull this information on my laptop via the myCadmium dashboard. Surveys & Evaluations – I can incentivize attendees to use the app by offering surveys and evaluations right within the app. I can then take it a step further and send out a post-conference evaluation to learn what people liked and didn’t like about the technology this year. Gathering data is one thing. Once we have all that data, we need to then analyze it and use it in meaningful ways. With app adoption, for example, we can refine next year’s messaging and keep the trend going upwards. We can see what emails people responded to well and how people were using the app at this year’s conference. We can then deliver messaging next year that focuses on those uses over the channels attendees used most this year. Get your events and marketing teams together and identify an event marketing problem your organization deals with. Talk through the 7 steps and use the worksheet above to identify channels, stakeholders, and goals, while tracking progress. Word-of-mouth, socially engaged, FOMO campaign. Increase traffic to expo hall/headline sponsor booths. Generate more leads for exhibitors. Increase attendance to certain sessions/events. Event management software is a powerful tool that comes built-in with some of the marketing tools you need. I hope this guide helps you use the tools you already have in new and exciting ways. I also hope you’ve identified new tools that you can use to manage and implement your event marketing campaigns. Please leave a comment below with any questions you may have, or share how you’ve used the Multi-Channel Event Marketing worksheet to achieve a specific goal at your events. 3 Responses to " Event Marketing 101: 7 Steps to Event Marketing Magic with Event Tech "